Chester Zoo is launching a personalised online campaign to coincide with a BBC TV drama 'Our Zoo', which airs this autumn. 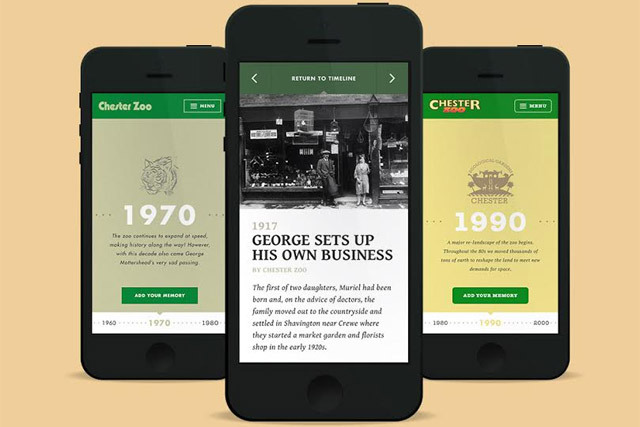 The campaign, ‘You Me and the Zoo’ launching today and created by Code Computerlove, will encourage visitors to the attraction to post their personal memoires of the zoo as part of an interactive timeline. The timeline, which spans Chester Zoo’s history since its beginnings in the 1930s, encourages visitors to include personal stories, anecdotes and photographs to chart how the zoo has evolved over the years. A BBC TV six-part drama 'Our Zoo' will air on Wednesday and follows the story of Chester Zoo’s founder George Mottershead, who is played by Lee Ingleby. Simon Hacking, Chester Zoo’s online marketing manager, said: "With the new prime-time BBC drama airing in autumn, based on the inspiring real-life story of our founder George Mottershead, we anticipate that there will be a lot of nostalgia around the zoo and a desire for people to share their own zoo stories from yesteryear."